Many children have told us that it makes them sad when their parents don't really sit down to play with them. Unfortunately, though parents want to get to know their children better, they mostly feel so overwhelmed by work and adult life that many of them keep postponing such crucial bonding. Luckily, our survey of 12 parents made it clear that putting down the cell phone and picking up a toy is a very simple and effective way to bring parent and child closer. How can it help? To see TDmonthly's recommended toys scroll to the end of the article or click here. Looking at a display of dolls, puzzles, and balls, most people simply see toys. But what your customers might not realize is that for children, toys and play are serious business. According to an article by Gabriel Guyton in the September 2011 issue of Young Children, "Play is the mechanism by which children learn—how they experience their world, practice new skills, and internalize new ideas—and is therefore the essential 'work of children'." And if play is the work of children, then toys are surely the tools of their trade! Playtime, and therefore any toy a child engages with during playtime, affects the brain. Years of research have shown that experience creates structure in the developing brain. Specific types of experiences stimulate various areas of the brain, which, in turn correspond to both physical and mental activities. Research supports the idea that interactive toys can especially contribute to cognitive skills, according to Dr. Susan Hardwicke. Children can learn and explore the world through toys on their own, but when a parent or caretaker gets involved, their engagement can increase. Caretakers can gently guide the play, asking questions that prompt further exploration, and attend to the child's safety. Parental involvement in play also helps kids learn about personal relationships - playing with parents is "important for children's developing self-esteem and social skills, including sharing, turn-taking, and developing friendships," according to the March 2010 article Why Play is Important from the Australian Office for Early Childhood Education. Play is also essential to the well-being of adults. In the article Play, Creativity, and Lifelong Learning, the authors state that "...Somewhere between childhood and adulthood, many of us stop playing. We exchange play for work and responsibilities. When we do have some leisure time, we're more likely to zone out in front of the TV or computer than to engage in creative, brain-stimulating play. By giving ourselves permission to play with the joyful abandon of childhood, we can continue to reap its benefits throughout life." Helping a child explore new toys is the perfect way to relax and develop one's own creativity and imagination. 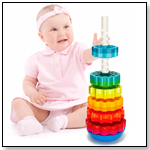 Different toys can help children develop certain skills at specific ages. Knowing more about these stages can help you direct your customers to the perfect toy. In an article in the Huffington Post, Dr. Toy (Stevanne Auerbach) says that, "The early years are intensely formative, a period when children gain knowledge about themselves and about their environment, develop basic motor skills, discover many of their abilities and gain the self-image and security that lasts a lifetime." Simple toys like wooden blocks, soft dolls and balls help kids start to build fine motor skills and coordinate, as well as curiosity and a desire to understand why their world works the way it does. 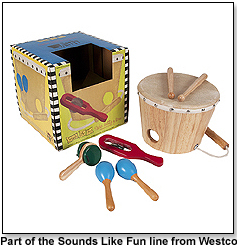 Musical instruments, like those in the "Sounds Like Fun" line from WESTCO EDUCATIONAL PRODUCTS, encourage the development of motor skills as children learn to grip instruments and move them to make a sound. Making music is also a great bonding activity for the whole family, as each member chooses and instrument and plays together. Products like the 2-in-1 iPotty with Activity Seat from CTA DIGITAL can can help kids learn about their physical abilities in a fun and engaging manner. "The first five years is the time when the most rapid physical, emotional and mental growth takes place," according to Dr. Toy. According to the National Association for the Education of Young Children (NAEYC), toys that encourage this growth include "Things for solving problems—puzzles (with 12 to 20+ pieces), blocks that snap together..."
Putting together a puzzle can help children start to build their spacial recognition skills and fine motor skills. 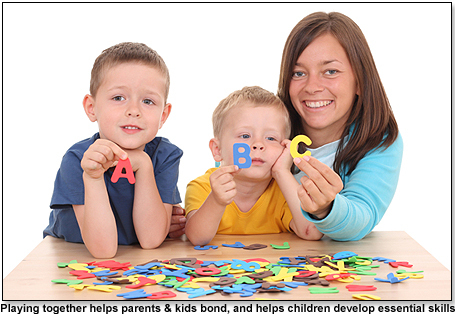 Puzzle pieces can also be used to build upon counting and color identification skills. Springbok Kids, from SPRINGBOK PUZZLES, are puzzles designed with young children of varying skill levels in mind. Each puzzle even comes with an educational handbook for parents, so they can make sure their little ones are getting the most out of their puzzle. 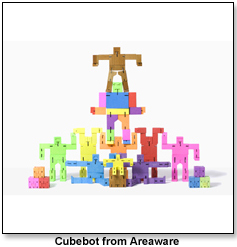 Cubebot® from AREAWARE is another product that can help kids start to develop their spatial and physical skills. A wooden "robot" figure comprised entirely of cubes, the Cubebot allows kids to move around its "body parts," creating new shapes and configurations. Once they are done, it's just as fun to try and put the Cubebot back the way it came. In preschool, kids are also starting to explore self-expression and creativity. NAEYC suggests "Things to create with" for children in preschool and kindergarten. Traditional arts & crafts toys can be used, but for some busy parents, the thought of setting up and then cleaning up an arts & crafts activity is so overwhelming, they don't even try. Luckily, CTA DIGITAL has a solution with the Kids Drawing Easel for iPad. This protective case holds the iPad like a traditional easel would hold paper, and kids can bring up an art App and draw and design to their hearts content - and frazzled parents don't have to worry about the clean up. As children get older, they begin to explore the world around them more broadly. 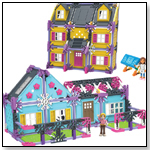 For children in the primary grades, Dr. Toy says ideal toys will "enhance reading, writing, math, science, or geography. They stimulate mental abilities, challenge thinking, and help them problem-solve." The staff of Family Education recommends that children of this age also use toys that help them "Develop special interests, skills, and hobbies." Educational toys can be fun, and helping children grow in these areas can be a great bonding experience for the family. MOVA Globes by MOVA are globes that rotate using only the energy of room light and the forces of Earth's magnetic field. Parent and child can explore Earth together, asking each other questions like "Where are we on the map? If you could travel anywhere, where would you go?," or delve into the science behind the globes' rotation. MOVA also offers constellation and planetary globes to help deepen the breadth of knowledge and get kids really passionate about science and astronomy. Another unique toy that helps kids develop an interest in the world around them is Zeenie Dollz. 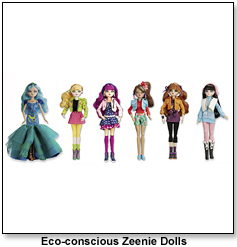 Zeenie Dollz are quirky fashion dolls with a message. Each doll focuses on an environmental issue, and playing with the dolls gives parents an opportunity to introduce eco-friendly practices and important environmental causes to their children, including: recycling, volunteering at animal shelters, learning more about the rainforest and making green practices a part of daily life. For school kids aged 8 and up, Opal & Twig Potions and Powers focuses on emotional education. Each of these fanciful kits ties into a book about two mysterious twin explorers, and the "enchantments" included focus on meaningful and positive personal betterment. For instance, the "Mermaid Tears" kit follows a story about how one character overcame tragedy and found joy. Included is a vial of "Mermaid Tears," to help cheer someone who is sad. With the help of the products above, you can guide your customers toward products that will enhance shared playtime between parent and child, encouraging mutual personal development and familial bonding. If you see a product you are interested in below, click on the company name to get their contact information and additional product/ordering information. MOVA Globes by TurtleTech Design, Inc.
Other products from TurtleTech Design, Inc.
MOVA Globes are perpetually moving decorative spheres meant to capture the imagination. The MOVA Globe rotates peacefully using only the energy of room light and the forces of Earth's magnetic field. No batteries or power cords are required. Each sphere spins freely without moving off its base. The globes come in many different designs: traditional world maps, starry constellations, MOVA planets and more. With their stunning design and unique technology, MOVA Globes fit in perfectly with any home or office decor. The MOVA Globe comes in 4 sizes, including diameters of 4.5", 6", 8.5", and 10". Based on Rudyard Kipling's The Jungle Book, Disney's new cartoon series captures all the adventure and fun as do Springbok's new, companion Jungle Book puzzles for Springbok Kids. Shere Khan prowls the jungle forest, always on the hunt, just like Kaa, the mighty python. In the middle of this danger is Mowgli, the very tasty "man cub," watched over by his best friends, Baloo, the bear, and Bagheera, the panther. This puzzle brings them all together in one colorful and charming "paws" in the adventures. 60 Piece Jigsaw Puzzle. These puzzles, designed especially for children age 4-10, come in three styles that specially accommodate a young child's rapidly growing skills. We even have a parent's guide book that comes with our Springbok Kids products for parents of younger children. What's better than one Scarlet Macaw? Try two, especially when one has wing's fully spread. If you love wildlife, the vibrant hues of these extra large parrots will dazzle you. This is nature at its best: rich color and exotic plumage make this Family Format® puzzle something the entire family can talk about. 400 Piece Jigsaw Puzzle. Family Format is a unique line that combines three completely different puzzle sizes into one puzzle, so that it is especially fun for family members of different ages to work together. Kids are naturally drawn to the highly visual and easy to use touch interface on the iPad. The many educational, artistic and entertaining apps available for children increases its value for parents who want to inspire their young creative minds. Keeping the iPad safe and secure by enclosing this in a traditional easel means parents can be relaxed about giving their child access to the tablet. Our highly original, intriguing and playful "Potions and Enchantments" are enjoyed by people ages 8 to adult who love fantasy, imaginative play and collectibles. The attractively designed and eco-friendly debut collection is tied together by a brand mythology centered around mysterious young twin explorers Opal & Twig, the fictional purveyors of the enchantments. A different short story book, each one more beautiful and engaging than the next, is included in every illustrated package. These introduce new fans to Opal & Twig and explain how each given enchantment was first discovered. Black and white contrast makes this set a perfect "first" musical instrument. The set includes a black and white rain maker and a black and white bell shaker. The Sounds Like Fun ABC Clappers are 3 brightly painted, hand crafted wood castanets with handles in graduated sizes and sounds. One side is labeled 1, 2,3, and the other side is labeled A, B, C. For color, number, shape and letter recognition, beginning pattern making, and hearing high and low sound changes. Includes a parent/teacher friendly activity guide for ideas on using the clappers to encourage child development. Launch date: 2005.